Something interesting I found: all of the first four Junior Arcades (the Putt-Putt and Freddi Fish ones) have in-house versions of level editors, or the ones that the developers used to design the levels! I figured I would use this thread to document each of them, and how they work. Let's get going! 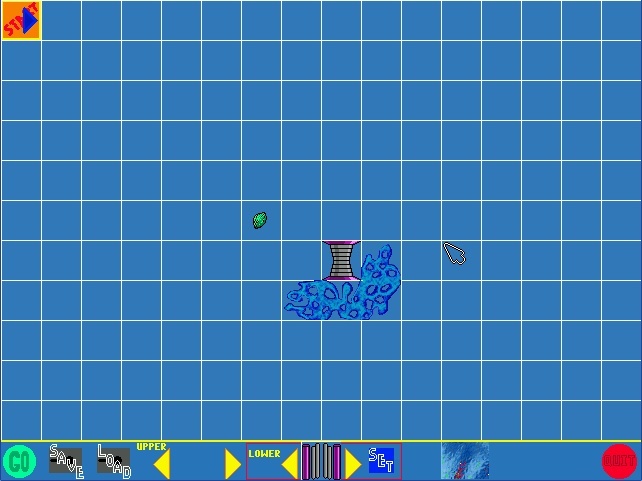 This one can be accessed two ways - either through the INI setting "RhettCool=1" and pressing E during a level, or by typing room 6 in the ScummVM debugger. However, I've only been able to test levels using ScummVM; doing it in the executable just takes you to the game's official level 1. This level editor is very basic and easy to use. 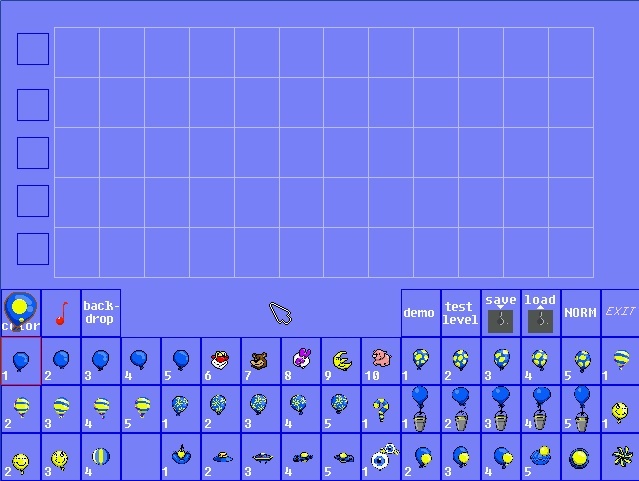 Just pick which balloons you want and place them wherever, and right click to erase them. 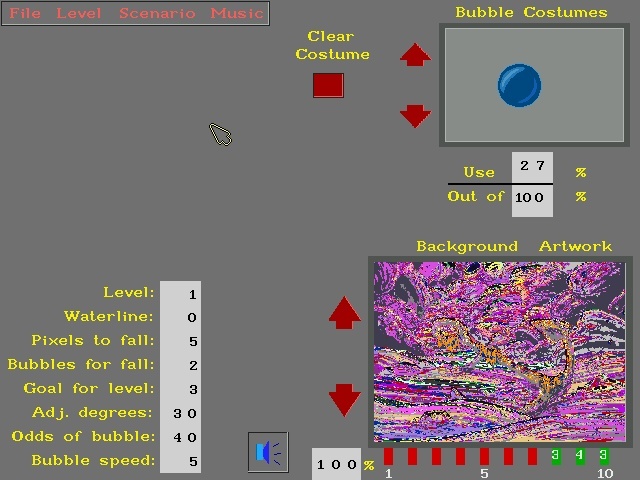 The top-left button controls colors. Click to do the primary color, and right click it to change the secondary color. The buttons along the side control Percival and the bonus space ships. The Back-drop button changes the background. The NORM button changes which layer you are using, so you can have regenerating balloons. Click Test to test the level. That's really all there is to it. Easy to use. I have no idea how to access this one using the executable, but it's in room 5 for ScummVM. This one is painfully easy to use, and is fully-functioning. Just tinker with it, you'll figure it out. One interesting thing about this editor is that there is an unused backdrop - a kitchen scene. You hop across giant food cans. Another really nice thing is that you can see entire backdrops with no scenery in the way. The only thing that I dislike is that the six-enemy limit still exists. This one seems to be the only one known to the public, though it is the most popular Junior Arcade, so I guess it's understandable. The RhettCool=1 mentioned above works here too, but typing room 5 also works. This one is easy to figure out, but tedious. That, and it has no known way of working. When you test it off the executable, it crashes. When you test it off ScummVM, it takes you to the game's official level 1. You just use the arrows to scroll through the pieces and click "SET" to change the sets of pieces. If someone can figure out how to test levels, please tell me. I've never really tinkered with this one too much because there's no level tester - you have to save a level before you can play it. I'd rather not mess with it. Anyway, this level editor is fully-functioning, but surprisingly complicated. That's ironic, because this is the easiest Junior Arcade (I dare you to die accidentally. No, seriously, I dare you). I don't know if an INI option for it exists, but you can just go to room 13 in ScummVM. You basically set the % chance that something will rise up. Pretty easy once you get used to it, though it crashes easily. One cool thing about this one is that you can pick whichever music track you want for your level, regardless of the background. So you can listen to this game's awesome and heavily under-appreciated soundtrack. Seriously, this game has better music than Maze Madness and Dog on a Stick. Pity it's on such a boring game. Whatever, mess with whatever you feel like. Well, those are the in-house editors in a nutshell. Not much else to say. SPY Fox in "Hold the Mustard" also has an in-house editor (go to room 3 in ScummVM), but I don't know how functioning it is. For extra fun, Backyard Soccer has a built-in editor too. It's not functional in ScummVM (requires extra U32 opcodes -- no way in hell was I doing extra work -- and it doesn't seem to be complete). Use the debug console to jump to room 4. What a nice surprise! Does Lost and Found have an In-House editor, or was it scrapped? It looks more like an editor for a DOS game! Those editors are interesting. I should try them out sometime.